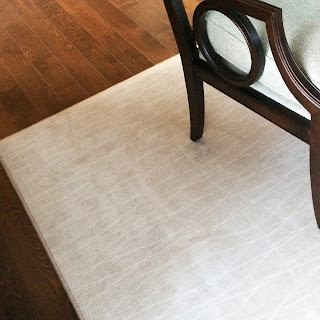 When Tatum H. needed area rugs for her home, she was looking for two things: high-quality, affordable options and a painless shopping process. By day, she runs a small business in Carmel, and she spends her weekends volunteering with her church, hustling to and from her daughters’ soccer games, and catching up with her husband. In order to maximize her time, Tatum considered ordering new area rugs online for her home, but the process of buying area rugs on the web is tedious and complicated. What size would look best in my room? What is the texture really like? Are the colors in the photo true to life? Area rugs are an investment, so shopping at a one-size-fits-all, big-box chain store wasn’t a fitting alternative to shopping online. Tatum wanted distinctive selections and a partner to help her make customized recommendations that she would love for years. Having done consulting work for Kermans Flooring in the past, she decided to swing by their showroom between meetings to get a feel for who they were. She was glad she did. 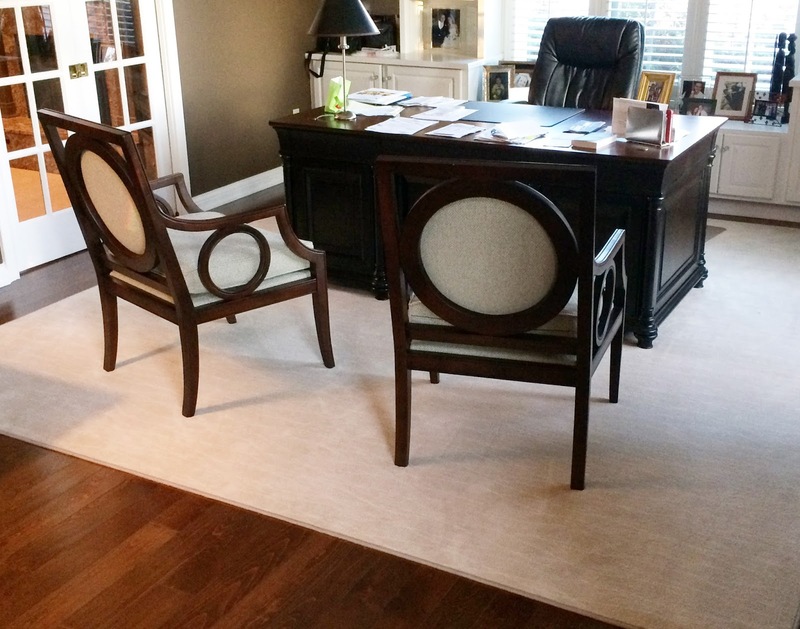 We spoke with Tatum about her recent experience working with Kermans Flooring design consultant Nichole Hansen. What were your goals when shopping for new area rugs? Tatum: In my new home, I have hardwood floors in the kitchen and den. They’re beautiful but noisy. I wanted to find the perfect area rugs to control the sound a bit and create a cozy, more welcoming atmosphere. There was a little extra pressure when shopping, too, because I knew my area rugs had to be perfect. The kitchen is the room we entertain in and spend a lot of our time. In the den, I remembered the area rug that the previous owner had, and it looked so good in the space. I was looking to buy something similar—or, even better—to go in that space. Tell us more about the rugs you purchased. Tatum: I started by considering pre-made area rug options for both rooms, and I quickly realized that was only going to be an option for my kitchen. I was grateful for the help I got from Nichole Hansen. She was the Kermans Flooring design consultant who did all of the heavy-lifting for me. Nichole was great. She showed me a lot of options and made the whole process of finding a pre-made area rug for my kitchen as easy as possible. On the other hand, finding the right choice for my den was a bit more challenging, mostly because my den is an odd size. To get what I needed, most of the pre-made options were out of the question. 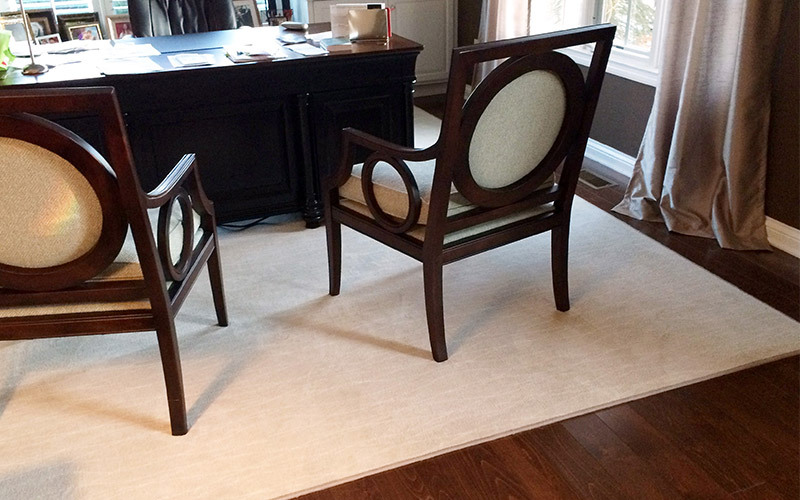 But, Nichole guided me through the painless process of getting a custom rug made. I couldn’t be happier with the results. The area rug in my den is modern and matches the aesthetic of my home better than any pre-made area rug would. It’s absolutely perfect. Tell us a little more about the custom-made process. Tatum: To be honest, when Nichole said the words “custom-made,” I balked. It sounded so expensive. In truth, though, getting a tailor-made area rug for my den required only a little extra effort. And, the best part? It was not as expensive as I thought it would be. Nichole helped me understand what size area rug I would need to work best in a unique space like my den. I would have struggled without her guidance. She even came out to measure my den to make sure the suggested size would work out perfectly. That’s the kind of service and attention to detail I really appreciate! She was helpful when it came to the area rug’s design, too. I wanted an area rug with a subtle and modern design, but I found it hard to visualize what that kind of pattern would look like on a larger scale in the den. Nichole simplified what could have been a stressful process. Using some photos that I had collected on Houzz for inspiration, Nichole showed me a collection of recommendations, all of which met my requirements. Next time I have flooring needs, I can’t wait to work with her again. I also recommend to others to create a profile on Houzz before going into the store. It made it easy to share my ideas. Tatum: I expected the price to be prohibitive. But, the cost for a custom-made area rug was actually a bit lower than some of the pre-made options we were looking at. Who knew? During the process, I also learned a lot about the importance of size. Nichole helped me understand the nuances of getting proportions right, and she gave me a really helpful area rug placement guide. It had a lot of helpful information and explained theories about framing and furniture placement. And, I guess I would also say that I was surprised at how much of a difference it makes to purchase from a store with exceptional customer service. Kermans Flooring values its customers. They treated me like I was special every step of the way. With online shops and at big box chain stores, you’re just a number. They don’t care. I resisted shopping for area rugs because I knew that I needed special attention to make the right choice. Those vendors make the home improvement process a real chore. That’s not the case with Kermans Flooring. They make you remember how much fun shopping for your home can be. The whole team is so nice and knowledgeable. A perfect example of their kindness? With the extra scrap material leftover from making my custom rug, Nichole offered to make me a runner or rug for use by my front door for a nominal fee. Kermans didn't have to do that, but Nichole suggested it, and I thought that was a nice option. Talk about going the extra mile. Tatum: I was surprised by how was fast it was. After I placed my order, it only took about two weeks for Kermans Flooring to make and deliver the custom area rug for my den. Would you go back to Kermans Flooring again? Tatum: Yes, I would definitely shop at Kermans Flooring again. In fact, we are looking forward to working with Nichole on my next project: replacing the flooring in the master bedroom. At Kermans, we don’t just help our customers sort through the options. We partner with them to get to know more about their lives. That way we can make the best recommendations for flooring solutions, like area rugs, that will last for years to come.